The Nautilus R616 and Schwinn 270 are two high-end recumbent bikes produced and sold by two of the most respected fitness equipment manufacturers today. These recumbent bikes are excellent choices for people who want to get fit in the comfort of their homes and without risking the health of their backs. But which is the better model? Find out in this Nautilus R616 vs Schwinn 270 comparison and review guide. The Nautilus R616 is a well-built recumbent bike that should appeal to people looking for a modern low-impact exercise machine. It measures 64 x 27 x 50 inches and weighs 97 pounds. On the other hand, the Schwinn 270 has similar dimensions as that of the Nautilus R616. As you would expect from a high-end piece of home gym equipment, the Schwinn 270 is well-designed. It doesn’t take up a lot of space in a room, too. The Nautilus R616 may weigh over 90 pounds but it’s still not as heavy as other top rated recumbent bikes in the market. There’s little lifting required save for the need to attach the base stabilizers. The frame is pre-assembled; from the seat rail to the crank system to the flywheel. This considerably reduces assembly time to around 45 minutes. Assembly of this machine can be a one-man job especially if you’re good at putting things together. There is a diagram that shows how to assemble the bike. You will also get bolts and tools you need to get the job done. The Schwinn 270 is also easy to assemble. Like the Nautilus R616, it is close to 100 pounds when fully assembled. But because its main base unit is pre-assembled, the machine can be put together by a single individual. The machine comes with front and rear stabilizers that can keep it upright and stable. Attaching those stabilizers merely requires screwing in of four bolts. Like its competitor bike, the user manual adequately details all the steps in assembling the machine. Most reviewers online agree that the only difficult part in the assembly is building the seat. The Nautilus R616 won’t likely to bore you even after using it for some time. There are 25 resistance levels in this recumbent bike. These machine uses Eddy Current Braking (ECB) resistance meaning it can keep workouts quiet even at high intensity, so you won’t be distracting anyone in your household when you exercise on this bike. You can also choose from the 29 workout programs integrated into this recumbent bike. 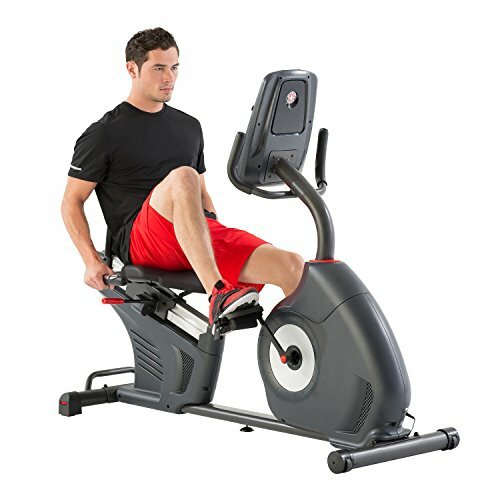 The high number of workout programs in this machine is one reason why it is priced higher than most recumbent bikes. It can also keep your workouts interesting and varied, further decreasing the chances you’ll get bored with this bike. On the other hand, the Schwinn 270 also has 29 workout programs to keep you engaged and interested. Included in those workout programs are 12 profile workouts as well as 9 heart rate control programs ranging from beginner to advance to custom. You can also save up to 4 programs. 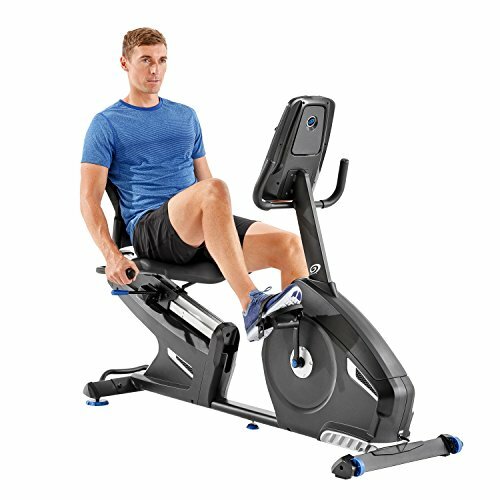 You’ll understand why this is a top-rated high-end recumbent bike what with the number of workout programs integrated into it. The Nautilus R616’s flywheel and belt are perimeter weighted and designed to provide a smooth pedaling motion regardless of the level of resistance. These parts of the bike are also fully enclosed to protect against damage. There might be some slight pushing at high resistance levels, though, as the pedals slow at the top of the cycle. Still, you can expect the bike to be quiet most of the time. Moreover, there is really no need for maintenance to keep things running smoothly. Schwinn 270 practically features the same drive type. It has a high-speed perimeter weighted flywheel that can keep workouts not only smooth flowing but also very quiet. The Nautilus R616 is also equipped with numerous accessories that you can expect from a top-rated fitness machine. There’s a water bottle located on the left-hand side of the seat. It’s large enough to fit most water bottles, although the placement is also a bit awkward because you have to reach behind to get the water bottle. It also has a USB charger where you can plug in your personal devices and a speakers/media port which allows you to listen to your favorite music or even watch videos. Just don’t expect the speakers to blast loud music. In fact, some users even say they would rather use headsets instead of using the speakers. There’s also a media shelf which can hold tablets or books and a three-speed fan incorporated into this recumbent bike. The Schwinn 270 shares practically the same set of accessories with the Nautilus R616. There’s a water bottle holder located on the left-hand side and positioned behind the seat. The media shelf placed on the console which you can use in placing media devices or books. The problem with this accessory is that it tends to cover up the upper display which can be a bit inconvenient for some people. It also has a USB port although most reviews indicate that it charges most units very slowly. There’s also a three-speed fan in this recumbent bike. Nautilus designed the R616 with comfort of its users in mind. This can be seen in the vented back and padded bottom of the seat, providing a very comfortable ride for most users. It also has an aluminum sliding rail system that you can turn to for adjusting and locking the seat in place. It can accommodate users who stand up to 6 feet 3 inches tall. However, some users complain that the seat tends to wobble over time. The Schwinn 270 has a seat which is equally impressive in built and design quality. It has a chair-like seat that can provide superior lumbar support. The bottom is well padded while the back is perforated, which is designed to keep users cool even while working out. The Nautilus R616 pedals are quite big meaning most people would have no problem using it. It has diagonally angled straps to prevent pinching. The Schwinn 270, meanwhile, features a 3-piece crank that offers a more pleasant pedaling experience. The pedals are also oversized, meaning most shoe sizes should fit into it. It is also textured with a strap that can be tightened or loosened. Both these recumbent bikes are equipped with high tech consoles. The Nautilus console has a backlit LCD window system with Bluetooth LE connectivity. The latter is arguably the biggest difference between the two bikes. With the Bluetooth-enabled Nautilus console, you can easily transfer fitness data from the Nautilus Trainer app to another Bluetooth-enabled device like smartphone or tablet. That’s not to say that the Schwinn 270 has a low-tech console. Its upper display measures 3 x 5 inches while the lower display is slightly smaller at 1 x 5 inches. The 2 LCD backlit displays make the console readable even in a room with low lighting. Although it cannot be argued that the lack of a Bluetooth function prevents the Schwinn 270 from getting over its competitor. It’s hard to pinpoint a clear winner in the Nautilus R616 vs Schwinn 270 match-up. Both recumbent bikes are well-made and designed. These home fitness machines practically have the same features. But the integration of a Bluetooth function in the Nautilus R616 gives it the slight edge over the Schwinn 270 bike.